iron rich foods for babies and kids. Iron is an essential nutrient at all ages, especially in the growing years, because it is required for making haemoglobin and carrying oxygen from lungs to various parts of the body. Without enough iron, kids tend to become pale and tired because nutrition is not properly distributed to their body parts, they find it difficult to fight infections, and face many other such problems. Rich sources of iron are Cereals, Millets, and Pulses like roasted Bengal Gram (Chana), cowpea and lentils (Masoor), Green leafy vegetables such as Amaranth, Cow Pea leaves and Shepu. Of the cereal grains and millets, Bajra, Jowar, Bulgur Wheat, Whole Wheat and Ragi are very good sources of iron. Milk although which is a good source of other nutrients, is a poor source of iron. Iron rich recipes for babies aged between 6 months to 12 months should be soft in texture because babies are still undergoing teething. Foods like vegetable mash, porridges, and broths are suitable for infants. Porridges like Bulgur Wheat Porridge and Jowar Ragi and Date Porridge are great to build up iron stores in small babies. Nothing like a healthy bhel made of Oats after school like Oats-and-Poha-Sukha-Bhel to top up your kids iron levels. We have created a healthy Chawli Mint Burger with whole wheat bread used to avoid giving kids junk food which leads to body inflammation with sugar and refined foods. Date and Almond Balls are ideal and healthy way to kill the sweet cravings of kids along with providing the necessary iron to their body. Halim is the king of iron and great dessert for girls to up their iron content with Halim Ladoo. Or try the Poha Phirni that kids would definitely love to have as a dessert. There is the Punjabi classic Aloo Palak to go with Minty Soya Roti and some Palak Raita, So much of iron if you combine them all in one meal. 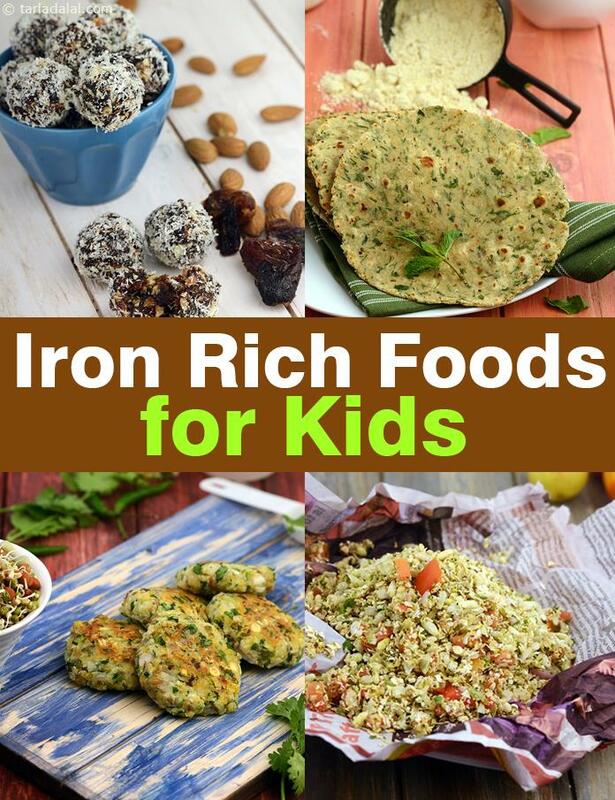 Enjoy our collection of Iron Rich recipes for kids. We would love to have your feedback. Enjoy our collection of iron rich foods for babies and kids and other kids articles below.